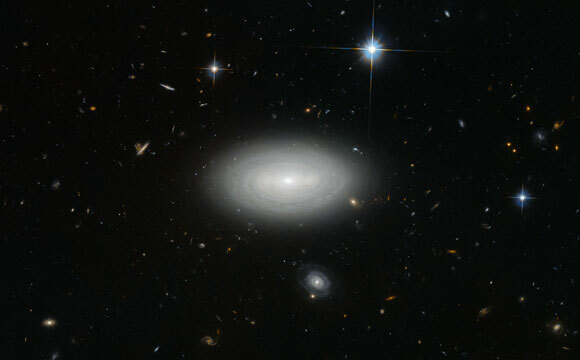 This newly released Hubble image shows spiral galaxy MCG+01-02-015. Only three local stars appear in this image, quartered by right-angled diffraction spikes. Everything besides them is a galaxy; floating like a swarm of microbes in a drop of water, and brought into view here not by a microscope, but by the Advanced Camera for Surveys on the Hubble Space Telescope. In the foreground, the spiral arms of MCG+01-02-015 seem to wrap around one another, cocooning the galaxy. The scene suggests an abundance of galactic companionship for MCG+01-02-015, but this is a cruel trick of perspective. Instead, MCG+01-02-015’s unsentimental naming befits its position within the cosmos: It is a void galaxy, the loneliest of galaxies. The vast majority of galaxies are strung out along galaxy filaments — thread-like formations that make up the large-scale structure of the Universe — drawn together by the influence of gravity into sinuous threads weaving through space. Between these filaments stretch shallow but immense voids; the Universe’s wastelands, where, outside of the extremely rare presence of a galaxy, there is very little matter — about one atom per cubic meter. One such desolate stretch of space is what MCG+01-02-015 reluctantly calls home. The galaxy is so isolated that if our galaxy, the Milky Way, were to be situated in the same way, we would not have known of the existence of other galaxies until the 1960s. 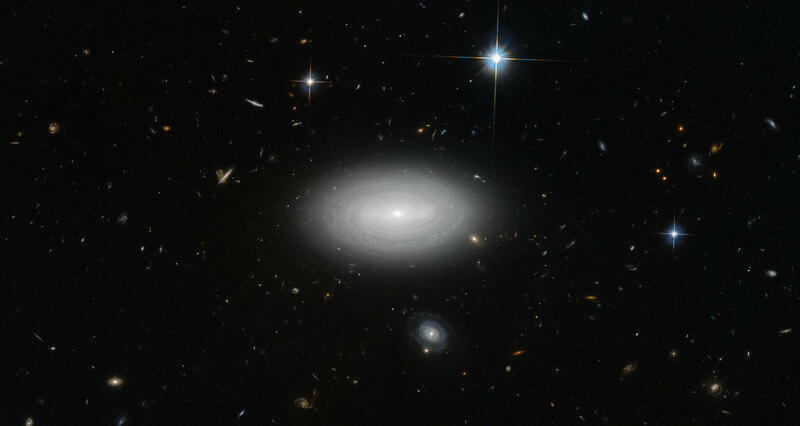 5 Comments on "Spiral Galaxy MCG+01-02-015 – The Loneliest of Galaxies"
How many light years out is it? How far is the galaxy? Could it be the ghost of our universe before all matter settle down to form the galaxies we see today after the Bang? Given where it is, this galaxy will never be involved in a galactic collision like happens in most parts of the Universe. The forever alone galaxy. Aww its cute.